The Glamorous Life of a Housewife: The Art of The PB&J. The Art of The PB&J. I've never been a huge fan of the PBJ until recently. I don't know why I have just acquired a taste for them, but I can't get enough! Husby is a PB&J connoisseur and he taught me the art of creating the perfect peanut butter and jelly sandwich. 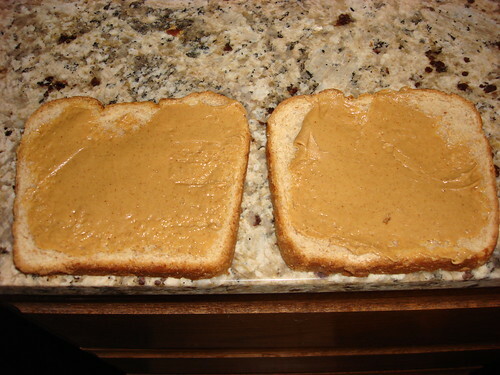 First, you spread a thin layer (well, I prefer a thin layer) of peanut butter on each slice of the bread. This is vital to the construction of the sandwich - it keeps the bread fresh and never soggy! Next, you get the jam and spread a thin layer (again, I like my layers thin) on one slice. I like the squeezable jam so that I don't have to spread the peanut butter and then clean the knife before getting the jam out of the jar. This way, I can just squirt and spread with the already used peanut butter knife! And there you have it - the perfect PB&J. The perfect amount of peanut butter to jam ratio in each and every bite! How do you make your PB&J? I am a one side peanut butter and one side jelly then slam it together kind of girl! Its weird you wrote this post because yesterday I had a PB&J sandwich for the first time in forever! I like my PB to be crunchy with strawberry jam, savoured with a nice cup of tea - yum! It is a rare occasion that I eat a PB&J. When I do,I like lots of peanut butter and a thin layer of jelly. My sister Debe used to make a PB&J and then throw it in a hot buttered skillet and "grill" it. It was one of her favorite ways to eat it. Lots of peanut butter and strawberry jam with bits of fruit in it. OR, better yet, peanut butter with sliced bananas between the bread! Not really a fan of PBJ, but whoever suggested putting it in a hot skillet of butter is my new BFF. Seriously, that is GENIUS! Haha, my husband would love you! He insists that the peanut butter HAS to be on both pieces of bread. I never do that for me! I may need to go buy me some peanut butter today! That looks yummy!! I put a LOT of peanut butter on each slice and a nice amount of grape jelly. 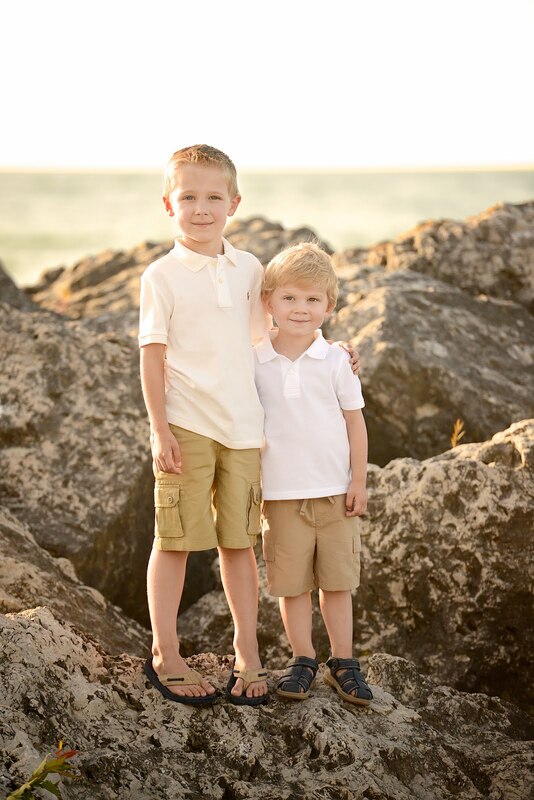 It oozes when I squeeze them together! Yummm. I hope you had a glass of milk handy! 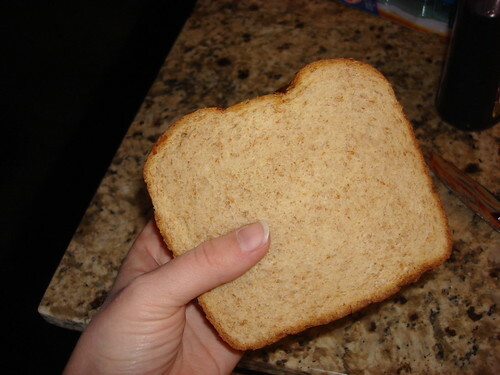 mmmm, i love me some PB&J's. I like thin layers, too. sometimes, i'm not in the mood for jelly, so i'll just do bananas instead. and then sometimes, i'll do peanut butter and nutella. or sometimes, i'll just eat chocolate. When I read this post, i totally thought about this song my mom taught me and we sang it when we made pb and j sandwiches . It is cute , maybe you can sing it to levi when you make one sometime! I'm a new follower! I have never been a big fan of PB&J (although like you, my husband LOVES them) but every once in a while they taste good. I prefer my bread toasted, raspberry jam, and the sandwich has to be cut on a diagonal. It just tastes better that way! @suze - HA! this post definitely reminded me of the PB&J song from Sheron Lois & Brahm. Which is Canadian. You know what else is Canadian?? STRAWBERRY Jam on a PB&J. Grape jam never touches my peanut butter. no sir. I do sometimes eat it with boysenberry jam (SO GOOD) which is purple. I've always done one side peanut butter and the other side jelly. I'll have to try peanut butter on both sides. I like lots and lots of jelly. It has to squirt out the back when I take a bite. I eat PBJ's just so I can eat jelly. Haha. I also like peanut buter and honey sandwiches. I mix up peanut butter and honey in a little bowl before spreading on my bread. My hubby likes to spread peanut butter on one side and honey one the other. I like both sandwiches in the toaster oven for a few minutes until the peanut butter is melty. MMM! You should try PBH if you never have before. I LOVE this! As a huge fan of the ease of PB&J, I can completely appreciate this post! 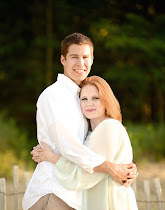 Thanks to the blogosphere for pointing me in the directing of your blog! We just don't do this in England! But tomorrow I'm going to have a go. I like both things separately, so why not together? 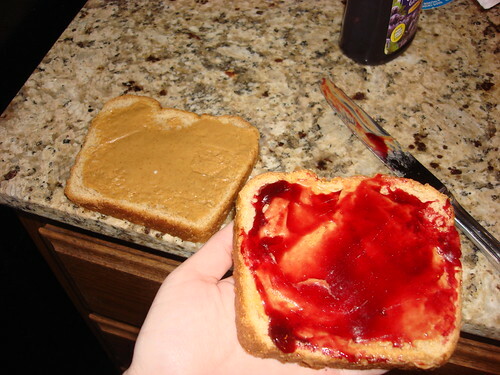 I spread a thin layer of peanut butter on one side and a thick layer of jelly on the other side. I dont like peanut butter all that much but it's necessary in a PB&J. I used to be a peanut butter and GRAPE jelly snob until this summer I made Strawberry freezer jam and it tastes sooooo good on a PB sammy :o) I haven't tried store bought strawberry jelly, but the homemade stuff sure is good. How funny to read this when a friend of mine just posted on HER blog, the "Proper Technique" to eating a sandwich!! I, too, spread a thin layer on EACH slice, then add the jam, place together and slice diagonally ALWAYS!!! Have to eat the corners first! LOL During BOTH pregnancies, I lived off PB&J!! Just say'n. I use a spoon! I use the back of the spoon to get pb out of the jar and onto one slice of bread. Then the inside of the spoon to get the jelly out and put is on the same slice!. I don't mind mixing the pb and j on the spoon, cause then I lick it off when i'm done and it is good! Toasted PB & J is one of my favourite breakfasts, but I have to have a cup of tea along with it. 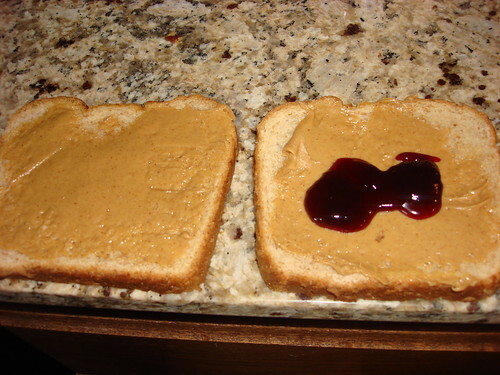 I just put the peanut butter on one slice and raspberry jam on the other. Sometimes I like to eat the the slices separately so that I can enjoy just one flavour at a time. Does it still count as PB & J? I think so! It's gotta have a very thin spread of butter on it as well. Seriously, give it a try...you'll never go back! Oh and I like thicker layers, especially the jam!!! You literally just inspired me to go eat a peanut butter and jelly sandwich! Thick on the peanut butter (MUST BE JIF creamy) on both sides, then a lot of jelly... 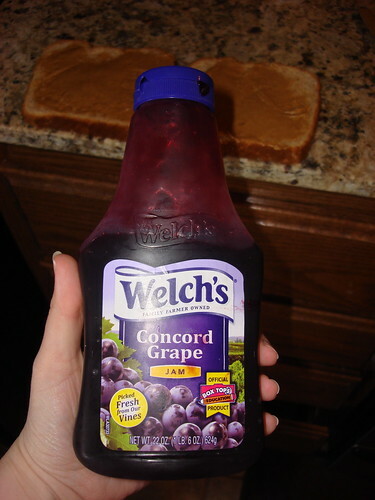 I love all kinds of jams or jelly's... Boysenberry, Blackberry, any of them. My husband liked one half of a slice of bread to be made with grape jelly and the other half strawberry so that when you cut it (diagonally of course) he will have two different kinds!